Moondog, who many cite for his countless influences on music and culture, was also known for his seemingly eternal presence at 54th Street and 6th Avenue. 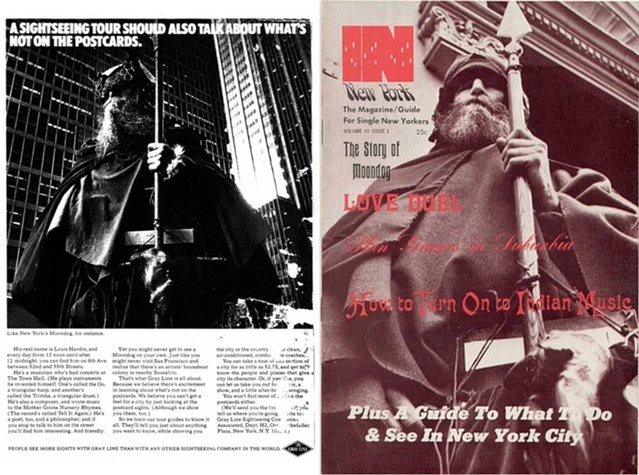 Moondog became, both figuratively and literally, a landmark of New York City. "A sightseeing tour should also talk about what's NOT on the postcards... Like New York's Moondog, for instance." "His real name is Louis Hardin, and every day from 12 noon until after 12 midnight, you can find him on 6th Ave. between 52nd and 55th Streets. He's a musician who's had concerts at The Town Hall. (He plays instruments he invented himself. One's called the Oo, a triangular harp, and another's called the Trimba, a triangular drum.) He's also a composer, and wrote music to the Mother Goose Nursery Rhymes. (The record's called Tell It Again.) He's a poet, too, and a philosopher, and if you stop to talk to him on the street you'll find him interesting. And friendly. Yet you might never get to see a Moondog on your own. Just like you might never visit San Francisco and realize that there's an artist's houseboat colony in nearby Sausalito. That's what Gray Line is all about." We're excited to bring this part of Moondog's story to life on the big screen, and are grateful for your support so far with our Kickstarter campaign! Please spread the word. "I draw inspiration from silence mostly."